“Rise and go”, the Lord said to Saul, who had fallen to the ground on the road to Damascus, and He sent Ananias to baptize the converted persecutor. “Rise and go”, the Pope said, is also a call to each of us, because a Christian “must be on his feet with his head held high”, while “a man with a closed heart is a man who is down”. For Mass at Santa Marta on Friday, 15 April, with a meditation on the biblical account of the conversion of Saul, taken from the Acts of the Apostles (9:1-20), Pope Francis continued to discuss the importance of docility to the action of the Holy Spirit, and to reflect “on the attitude of those people who have a closed heart, a hard heart, an arrogant heart”. The liturgy of the preceding day had highlighted how both the Apostle Philip and the queen’s minister had their hearts open to the voice of the Spirit”. This Friday of the Third Week of Easter, then brings us the story of Saul, “the story of a man who lets God change his heart: the transformation from a closed, hard, misguided heart to a man with a heart docile to the Holy Spirit”. (Vatican Radio) Pope Francis on Friday received the President of Bolivia, Juan Evo Morales Ayma, who subsequently met with Archbishop Paul Richard Gallagher, the Secretary for Relations with States. “During the discussions, which took place in a cordial atmosphere, various themes were considered regarding the current socio-economic situation of the Country, with special attention to social policy. The parties focused on the relations between Church and State, evoking Bolivia’s long Christian tradition and the decisive contribution of the Church to the life of the Nation. President Morales came to Rome to attend a conference sponsored by the Pontifical Academy of Social Sciences marking the 25th anniversary of Pope St. John Paul II’s social encyclical "Centesimus Annus." Monsignor Marcelo Sánchez Sorondo reads Pope Francis' message to the #CentesimusAnnus participants! 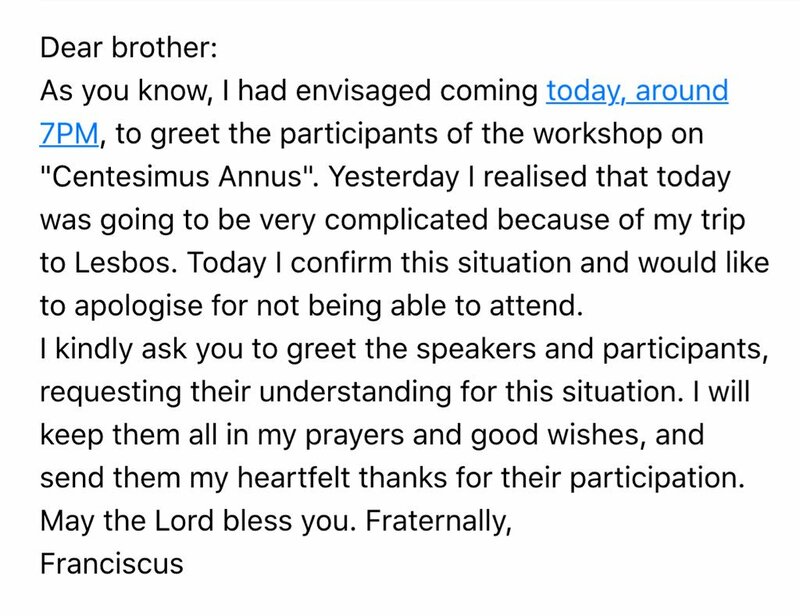 (Vatican Radio) A major international conference sponsored by the Pontifical Academy of Social Sciences is hosting a conference this weekend looking at the 25th anniversary of Pope St. John Paul II’s landmark social encyclical letter Centesimus annus. Centesimus annus was itself an anniversary marker: celebrating the 100th anniversary of the seminal Papal piece of writing on social matters in the modern world, Rerum novarum, by Pope Leo XIII in 1891. Centesimus annus was written at a moment of massive change and upheaval in politics and economics in the wake of the collapse of the Soviet Union, and in the midst of an unprecedented increase in wealth and standards of living across the globe that were threatened by corrupt and exploitative interests. Its purpose was to welcome a vision of morally ordered liberty in the service of the human person. Now, scholars, policymakers and political leaders from around the world are gathered in the Vatican to take stock of political, economic and cultural changes since the release of Centesimus annus​​, and offer a critical appraisal of Catholic social doctrine’s engagement with the world over the same period and into the future. Presidents Evo Morales of Bolivia and Rafael Correa​ of Ecuador are among the participants, as is US Senator Bernie Sanders, the Democratic Socialist independent from Vermont who is seeking the nomination of the Democratic Party as its candidate in the November presidential election in the United States. (Vatican Radio) Pope Francis will spend six hours on the Greek island of Lesbos on Saturday, April 16, where – together with Ecumenical Patriarch Bartholomew of Constantinople and the Greek Orthodox Archbishop of Athens and All Greece, Ieronymus II – he will spend time with refugees. The Holy Father is received by the Prime Minister; and is then welcomed by His Holiness Bartholomew, Ecumenical Patriarch of Constantinople, His Beatitude Ieronymos, Archbishop of Athens and All Greece, and after this, by Bishop Franghískos Papamanólis, O.F.M. Cap., Chairman of the Greek Episcopal Conference. 10:55 Transfer by minibus with His Holiness Bartholomew and his Beatitude Ieronymos to Mòria refugee camp(16 Km). Along the barricades will be gathered about 150 minors who are guests of the center. The religious leaders will go across the courtyard dedicated to the registration of refugees and will arrive at the big tent to individually greet about 250 asylum seekers. 12.25: Speech by Archbishop Ieronymos; by Patriarch Bartholemew; and by Pope Francis at the podium of the courtyard for refugee registration. 12.40: Signing of the joint declaration. 12.45: Lunch with the three religious leaders with the some of the refugees in the space behind the podium. 13.45 arrival at the headquarters of the Coast Guard. MEETING WITH CITIZENS AND THE CATHOLIC COMMUNITY. MEMORIAL FOR THE VICTIMS OF MIGRATION. At the end, the three religious leaders will each recite a brief prayer for the victims of migration. After a minute of silence is called for, the three leaders will receive from three children laurel wreaths, which will be thrown into the sea. 14:15 transfer by minibus to the airport (3 Km). 15:15 Departure by plane from the international airport of Mytilene for Rome. 16:30 Arrival at Rome’s Ciampino airport. Starts at 12.35 pm . Pope Francis meets with Lesvos citizens and the catholic community at the port. followed by a Farewell ceremony and Departure from the international airport of Mytilene for Roma. (Vatican Radio) Following his arrival on the Greek island of Lesbos, Pope Francis met with Greek Prime Minister Alexis Tsipras. Discussed at the meeting was the refugee and migration crisis, in particular the situation on the island. It was stressed "that the refugee crisis is a European and international issue calling for a comprehensive response that respects European and international law." (Vatican Radio) “You are not alone”. That was Pope Francis’ message to migrants and refugees on the Greek island of Lesbos where up to half a million asylum seekers have arrived over the past year and a half. His brief visit to the island, alongside Ecumenical Patriarch Bartholomew and the Orthodox Archbishop Hieronymus of Athens, aimed to draw international attention to the plight of all those fleeing across the Mediterranean sea to escape conflict and persecution in their home countries. This was Pope Francis’ 13th journey outside Italy, but as he told journalists on the short plane trip over from Rome to Mytilene, the capital of Lesbos, this visit was different. It was a visit, he said, marked by sadness for the suffering of so many people caught up in the worst humanitarian crisis since World War II. As he did during his first pastoral journey to the Italian island of Lampedusa in 2013, the Pope was able to see and hear that suffering first hand. In the eyes of women, unable to contain tears as they told of losing husbands to the wars in Syria and Iraq. In the voices of men, weeping openly as they pleaded for him to do something to ensure security for them and their families. In the drawings which children handed to the Pope on crumpled pieces of paper, depicting themselves behind barbed wire fences or in boats making the perilous journey on which many of their friends have drowned. (Vatican Radio) Pope Francis on a visit to the Moria refugee camp on the island of Lesbos, told those gathered, "You are not alone". He also told them not to lose hope adding, "the greatest gift we can offer one another is love: a merciful look, a readiness to listen and understand, a word of encouragement, a prayer." The Pope was accompanied by the Ecumenical Patriarch Bartholomew of Constantinople and the Greek Orthodox Archbishop of Athens and All Greece, Ieronymus II. (Vatican Radio) Pope Francis, along with Ecumenical Patriarch Bartholomew, and Archbishop Ieronymos of Athens and All Greece, released a joint declaration during their visit to the Greek island of Lesbos on Saturday. The three leaders signed the joint declaration at the end of their visit to the Moria refugee camp. The declaration calls on the international community to respond with generosity and compassion to the tragedy of forced migration, calling it a 'crisis of humanity'. In the face of this crisis, the church leaders restated their desire to work toward the unity of all Christians. "For our part, in obedience to the will of our Lord Jesus Christ, we firmly and wholeheartedly resolve to intensify our efforts to promote the full unity of all Christians... By defending the fundamental human rights of refugees, asylum-seekers and migrants, and the many marginalized people in our societies, we aim to fulfil the Churches’ mission of service to the world." In conclusion, the declaration urges the international community to "make the protection of human lives a priority and, at every level, to support inclusive policies which extend to all religious communities". (Vatican Radio) Pope Francis had lunch on Saturday with a group of 8 refugees at a container inside the Moria refugee camp on the Greek island of Lesbos. The Pope was accompanied on his visit to Lesbos by the Orthodox leader, the Ecumenical Patriarch of Costantinople, Bartholomew I, and the Greek Orthodox Archbishop of Athens and All Greece, Ieronymos II. The three spiritual leaders toured the Moria camp and met refugees and migrants being held inside it before sitting down to their lunch. (Vatican Radio) Pope Francis during his encounter with civil authorities and the Catholic Community at the Port of Lesbos prayed for all the men, women and children who have died after leaving their homelands in search of a better life. He was joined by Ecumenical Patriarch Bartholomew of Constantinople and the Greek Orthodox Archbishop of Athens and All Greece, Ieronymus II who also prayed for all those in difficult circumstances. Following the prayers the three religious leaders dropped flowers into the waters off the port of Lesbos to remember the victims. (Vatican Radio) Continuing his visit to the Greek island of Lesbos on Saturday, Pope Francis expressed his admiration for the Greek people who, despite their own great difficulties, have "kept open their hearts and their doors." He was addressing Civil Authorities and the Catholic community on the island where he also renewed his "heartfelt plea for responsibility and solidarity in the face of this tragic situation." (Vatican Radio) Pope Francis took three Syrian families and their six children back with him on the plane to Italy when he left the Greek island of Lesbos after his 6-hour visit there. On board the Papal plane en route to the Greek island of Lesbos where he is visiting refugees, Pope Francis remembered his predecessor in his prayers saying, "I would like to remind you that today is the 89th birthday of Pope Benedict XVI. Pray for him"
Later this evening the Pope Emeritus is expected to attend a concert in his honour in the Vatican. The Holy Father Francis, along with all those who accompany him in his visit to Lesbos - entourage and journalists send Emeritus Pope Benedict XVI the most affectionate and cordial greetings on the occasion of his 89th birthday, asking the Lord to continue to bless his precious service of closeness and prayer for the whole Church. (Vatican Radio) Pope Francis gave a 30 minute press conference on the flight back from Lesbos to Rome on Saturday, sharing thoughts on a wide range of subjects including his opinion regarding the deal between the EU and Turkey, his meeting with Bernie Sanders, the closure of European borders and his recent apostolic exhortation. The Pope began his traditional ‘conversation’ with journalists aboard the papal plane reflecting on the fact that the visit to Lesbos had had a very strong emotional impact on him. Asked what he thinks about the recent deal between Brussels and Ankara, the Pope highlighted the fact that his visit to Lesbos was undertaken in a purely humanitarian spirit. Regarding the fact that he has brought three refugee families back to Rome with him, he said the decision was the fruit of a ‘last-minute’ inspiration one of his collaborators had a week ago. “Everything was arranged according to the rules. They have their documents. The Holy See, the Greek government and the Italian government have checked everything. They have been welcomed by the Vatican and with the collaboration of the Saint Egidio community they will be searching for work” he said. In his presentation that day, Schönborn said the document had made some "organic development" of the church's pastoral practice for divorced and remarried couples. "I recommend to all of you to read the presentation that Cardinal Schönborn made," the pope said Saturday. "He is a great theologian." Aboard the papal plane, Apr 16, 2016 / 11:09 am (CNA).- Pope Francis on April 16 gave a 25-minute press conference for reporters during his return flight to Rome from Lesbos. The Pope spoke about the refugee crisis and the global immigration crisis. He spoke of the 12 Syrian refugees, including six children, he was bringing to Italy on the flight. Pope Francis said he saw a global family crisis and voiced concern that this was missed by media coverage of the controversy over Holy Communion for those who have divorced and remarried. Pope Francis: “First of all, there is no political speculation because I didn’t know much about these accords between Turkey and Europe. I saw them in the newspapers. Bringing these refugees away is a humanitarian thing. It was an inspiration from a week ago that I immediately accepted, because I saw that it was the Holy Spirit who was speaking. Everything was done legally. They’ve come with us with their documents in order. The Vatican, Italy and Greece have given them a visa. They will be welcomed by the Vatican with the collaboration of Sant’Egidio who will find work for them. But they are guests of the Vatican and they are added to the two Syrian families that are already given hospitality by the two Vatican parishes. Second. This morning when I walked out, there was Senator Bernie Sanders who came to the congress on “Centessimus Annus.” He knew that I was leaving at that time and he had the courteousness to greet me. I greeted him and his wife, and another couple with him that was staying in Santa Marta, because all of the members of the congress, except the heads of state who I believe were staying in their embassies, were staying at the Santa Martha residence. I gave a greeting and nothing more. A greeting is an educated thing to do and does not mean to be mixed up with politics. If someone thinks that to give a greeting means to get mixed up in politics, I think he needs a psychiatrist. (Vatican Radio) Pope Francis celebrated the World Day of Prayer for Vocations by ordaining eleven men to the priesthood at St Peter’s Basilica on Sunday. Pope at Regina Coeli: Jesus' love is invincible! (Vatican Radio) At the Regina Coeli on Sunday, Pope Francis spoke about the day’s Gospel, where Jesus describes Himself as the Good Shepherd. In his reflection, Pope Francis said the words of Jesus – My sheep hear My voice, and I know them, and they follow Me – “help us to understand that no one can call himself a follower of Jesus if he does not listen to his voice. Listening to Jesus, the Pope continued, does not mean hearing in a superficial way, but engaging with the Lord’s words in order to come to a “generous following,” expressed in the words “and they follow Me.” This listening, he continued, means listening with our hearts, not just with our ears. (Vatican Radio) Pope Francis met on Monday with the President of the Central African Republic, Faustin Archange Touadéra, recalling the warm welcome he received during his pastoral journey to that country last November. During his visit to the Vatican, the President also held talks with Secretary of State Cardinal Pietro Parolin and the Secretary for Relations with States, Archbishop Paul Gallagher. A statement from the Holy See press office said the cordial talks between the Pope and the President noted how the recent electoral process and the ongoing institutional reforms are taking place in a constructive manner, supported by dialogue between the different religious communities. The two leaders expressed the desire that this process may mark the start of an era of peace and prosperity for the entire nation.